the limit of a secant. 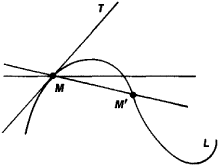 The tangent is defined as follows: Let M be a point on the curve L (Figure 1). Select a second point M on L and draw the line MM’. 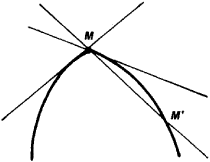 Let us consider M to be stationary, and let the point M approach M along the curve L. If, as M approaches M, the line MM’ approaches a single definite line MT, then MT is called the tangent to the curve L at the point M. Not all continuous curves have a tangent, since the line MM’ may not approach a limit or may approach two different limits when M approaches M from different sides of M (Figure 2). Any line that passes through a point M on a surface S and thatlies in the tangent plane to S at the point M is called a tangentline to a surface S at a point M.
That is, the center of the ellipse is within the area bounded by the two red lines while the slope of the tangent lines is within [L,U]. Real-time limitation of the replanning algorithm is addressed based on looking at the geometric operations in a coordinate chart such as algorithms used for geodesic computation, intersection checking and the computation of intersection point P of geodesic with circle (see (14)), determination of the tangent direction, critical points determination either via tangent lines to make a directional sweep of the terrain or via search in coordinate parameter space nearby P, projection of the point on tangent plane onto the manifold, collision checking of the new composite geodesic path with the obstacle, and computation of the angle sum of geodesic triangle for applying Gauss-Bonnet Theorem. Two examples of the latter are (1) the characterization as unions of ovals or ovoids with an additional assumption on the tangent lines or planes, see ,  and ; these characterizations also hold for certain projections of the varieties, (2) the characterization as representation of a projective space in another projective space where lines of the former are ovals or ovoids in the latter, see  and . By moving the origin up, again the tangent line occurs at a higher airspeed, which makes sense since you'd want to get the heck out of there. For example, you could draw a graph and a tangent line to that graph at a point using basic Maple commands, but it takes a fair bit of work. Mandibular plane A tangent line to the lower border of the mandible (figures 1, 2). Tangent line approximation Khumawala and Kelly showed that for a given open facilities set, a tangent line cost approximation used in transportation procedures leads very rapidly to an optimal assignment of customers to facilities. 3) In the case of C(2, 2, 2): For any common tangent line of two of the quadrics [[Gamma]. If a break or curve cannot be avoided, make the parting line at a right angle to the tangent line, Figure 5. Engineering services for the implementation of SEA to ensure the availability of the tangent line is Basel-Stadt 2025 for Phases 32-53. Analysis features in graphing mode allow users to perform linear and curve fits, draw a prediction line before collecting data, display multiple graphs at once, display a tangent line on the graph, get peak integration, baseline adjustments and more.